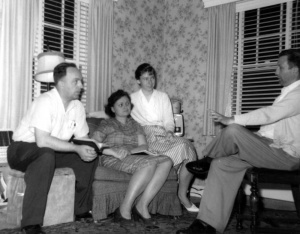 Difference between revisions of "Centereach Mennonite Church (Centereach, New York, USA)"
Franconia Mennonite Conference began a church plant in Centereach, Long Island, New York in 1953. Eugene Souder, raised in the Rockhill Mennonite congregation, Telford, Pennsylvania, and a recent graduate of Eastern Mennonite College, moved with his wife Alice to Centereach for one year to help lay the groundwork. Eugene’s education and experience were very helpful in getting the mission started. Fellow Rockhill members Curtis and Mildred Godshall also moved to Centereach with their children. Curtis Godshall served as pastor of the new congregation for the first 10 years. Another family from Rockhill, Stuart and Myrtle Heebner, joined the group within a year or two. Shortly thereafter a number of young married and single folks began serving in I-W alternative service at a nearby veteran’s hospital. Some of them attended and became involved at Centereach Mennonite, mostly just for the length of their two-year service. For some time, worship services were held in the Godshall home, but once there were a good number of local people attending, Franconia Conference helped with voluntary labor to build a small meetinghouse on property Curtis Godshall had bought with his house. An important part of the church during these early years was a two week Summer Bible School program attended by an average of 150 children. Teachers would come from eastern Pennsylvania and other areas to help with the program. 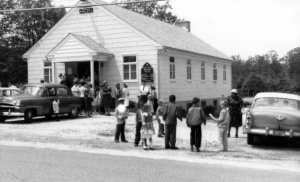 The 1950s were a time of change and growth in the wider Mennonite Church. Some were afraid the church would lose its traditional “separation from the world.” There was excitement over new churches like Centereach and people of non-Mennonite background who were joining the Mennonite Church, but there was also significant disagreement and stress over how to handle change. There was a strong pull from churches and leaders “back home” in eastern Pennsylvania that sometimes conflicted with the adaptation and outreach needed to grow a church in Centereach. In 1963 Curtis Godshall was called to pastor a church in Allegheny Mennonite Conference, and a new pastor, Homer Detwiler, moved to Centereach with his wife Pauline and children. The rate of change picked up in the 1960s, and as the military draft declined, there were no longer I-W workers in the community. The congregation gradually had less participants. Long Island in those days had a somewhat transient population, and some local members moved on to other parts of the country. Some aged and died, and some from Pennsylvania moved back to their home communities. After nearly two decades of ministry and outreach, the work at Centereach Mennonite Church ended in 1970. After serving a non-Mennonite congregation for some years, the meetinghouse was purchased in 1981 by a Theravada Buddhist community and served in 2012 as the Vajiradhammapadip Temple. Landis, Glenda Godshall. "Centereach Mennonite Church (Centereach, New York, USA)." Global Anabaptist Mennonite Encyclopedia Online. January 2013. Web. 24 Apr 2019. http://gameo.org/index.php?title=Centereach_Mennonite_Church_(Centereach,_New_York,_USA)&oldid=62749. Landis, Glenda Godshall. (January 2013). Centereach Mennonite Church (Centereach, New York, USA). Global Anabaptist Mennonite Encyclopedia Online. Retrieved 24 April 2019, from http://gameo.org/index.php?title=Centereach_Mennonite_Church_(Centereach,_New_York,_USA)&oldid=62749.